Almere City were playing an extremely high scoring football in the previous season in the first division in Holland. They have scored 70 goals in 38 matches played but they have also allowed 76 in total. Jong Utrecht were also as bad in defence with 76 goals allowed. Almere have started the new season with a 3-2 win on the road against Jong AZ. They drew the latest match with Maastricht with the score 2-2. Jong Utrecht are comning deom a 3-2 win against Jong PSV, in the opening match they have allowed 5 goals against GA Eagles. 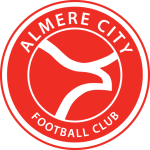 Almere City and Jong Utrecht have met twice in the previous season and they have combined 9 goals in these two games played. Another high scoring match is my prediction for today also. Postp. Jong Ajax - Twente ?-?